What I love about my work is that time is flexible. Today, I got in a little late because I went to the grocery with my mom for my sister’s mini birthday bash later. I and Mom are still in the grocery when my phone’s battery went out, and I didn’t worry much because work is just 5 minutes away and I can immediately charge upon coming in. I immediately looked for my charger and plugged the phone in. I turned it on and found quite a number of messages from Jhay (my beau, by the way), latest says he’s on his way to my workplace. I hurriedly put on some loose powder then checked in my desk mirror if I look okay. 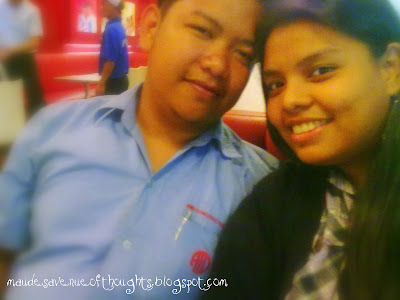 In less than a month, we’re turning 5 years but the thought of being with him still makes my heart beat faster. We’ve already had countless lunch outs but I still get that same crazy feeling when he comes over when I least expect it. Who cares if it’s just Jollibee?